We have written previously on this blog about preparing your new Yixing teapots for first use, but some things bear repeating. A recent photo posted by Guitian’s Tea Club on her Facebook page prompted a revisit to this important topic, especially since that article mentioned above didn’t go into too much of the details. No, we’re not talking about spices and herbs here. This is quite different! Basically, seasoning an unsealed, porous zisha clay teapot or even something like cast iron cookware means letting it absorb some of the substance you will be steeping/cooking in it. With cast iron cookware, you normally use some type of cooking oil or shortening. With teapots (the zisha clay kind which are unsealed), you use a particular type of tea. Start with a wash (water only, never use soap of any kind) of the pot to remove any loose bits. Choose the tea you want to use with the pot since it will be flavoring that pot and subsequent infusions of tea. Mini-steep — Boil some water and pour it into the teapot, but try not to let it overflow. Let the teapot sit for about 10 minutes and then pour out the water. Fill the pot with boiling water again and add one teaspoon of your favorite loose tea leaves. Remember, this should be the type of tea you will use this pot for. Allow to sit for ten minutes. Drain the tea. Now your pot is ready for use. Overnight Soak — Place the teapot and lid separately in a cooking pot (that can take direct heat) large enough for you to cover them with water. Then, add the water and some tea leaves (the kind of tea you want to use from that point on with that teapot) into that cooking pot. Heat slowly to a boil (heating rapidly could damage the teapot) and continue the boil for an hour or so. Remove the cooking pot from the heat, leave the teapot and lid in the water, and let them sit for about 24 hours. Then, rinse the pot and lid with clear water and put them back in the cooking pot. Bring the water slowly back to a boil and let boil for another hour. Next, let the water, the cooking pot, and teapot cool for a day. You’re almost there so stick with it. All you need to do now is remove the teapot from the cooled water and rinse a final time in hot water. All set! Full Steep — Start by a gentle rinse with clear, cold water of the teapot to remove any dust or residue. Wipe inside and out with clean paper towels to get any remaining bits off. Boil about 1 to 2 gallons of water, depending on the size of your teapot, in a large cooking pot, and then turn off the heat, add 3 to 5 teaspoons of dry tea leaves of your choice, and let the tea steep for 10 minutes minimum. Using tongs, lower the teapot and lid into the tea and let stand for a half hour or until the water has cooled a bit. Seal the top of the cooking pot with plastic wrap and leave all in place for a week, checking on it now and then. Carefully remove the plastic wrap and lift the teapot and lid out of the water, then rinse them with cold water and let dry completely. Now you’re ready for some serious tea steeping! There are a number of variations on the above posted on various Web sites, but these will give you the general idea. There is some debate about the practice of pouring hot water over the outside of your teapot. Some say it keeps the teapot warm during steeping while others say it removes the sheen on the teapot’s exterior. Your choice here, since you will need to decide which is more important to you: sheen or hot tea. One thing that is also recommended when using your Yixing zisha clay teapot is to handle it and let the oils from your fingers build up and add to the teapot’s sheen. Here’s hoping you’ll enjoy your teapot for many years to come! 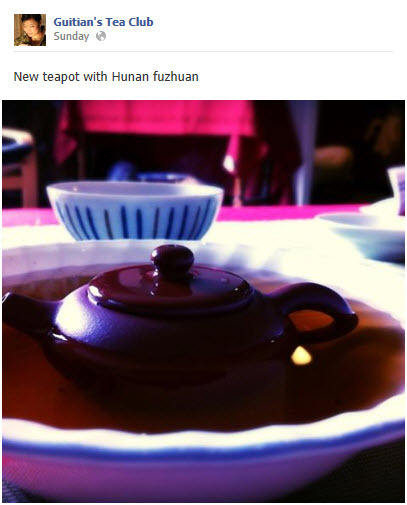 This entry was posted in Teawares and tagged JAS-eTea, tea steeping, Teawares, yixing. Bookmark the permalink.